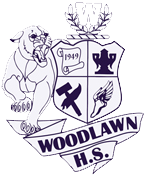 Woodlawn High School offers Advanced Placement, Agricultural Science I and II, Gifted and Great Scholars, Honors, Hospitality and Tourism, ProStart, Talented (Art, Music, and Theatre), Technical (Welding and Electricity), and Traditional courses. The faculty and staff are committed to implementing and providing a school environment conducive to learning and to helping students achieve success. Students may participate in several sports and activities: Band, Baseball, Basketball, Bowling, Cheerleading, Choir, Cross Country, Dance (Pantherettes), Golf, Football, Flag Team, Jazz Ensemble, JROTC, Panthrobitcs, Powerlifting, Soccer, Softball, Swimming, Tennis, Track and Field, Volleyball, and Wrestling.